With regular use, this cream helps you get a smooth and radiant skin by visibly reducing dark spots, pigmentation and uneven skin tone. 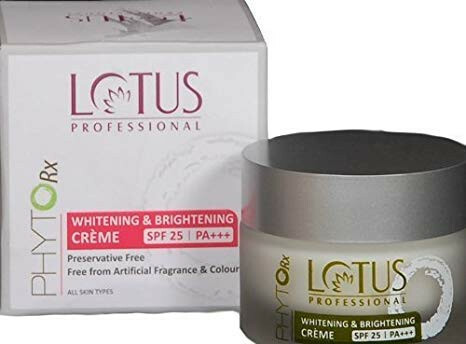 Lotus Herbals Professional Phyto-Rx Whitening & Brightening CREAM A revolutionary TRI-Action formulation based on Amlaberry, Lychee & Punarnava root extracts.If you are looking for a fairness cream that also gives you good sun protection, then you can go for the Phyto Rx Whitening and Brightening Creme from Lotus Professional. Effective skin lightening agent. Lychee : Anti-oxidant, boost moisture and promote healthy skin. I'm really impressed with the product. It has improved my skin and evened out my tone.